mixture of honey or grape syrup and flour. 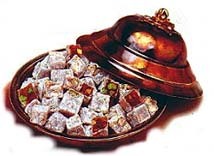 Once confectioner Haci Bekir obtained white sugar he developed the smooth, translucent sweet known today as Turkish Delight. In addition to the traditional rose and lemon flavored varieties you can find many other types such as walnut, pistachio and coconut.